petition: Honor Iwo Jima photographer Joe Rosenthal with a US Navy warship. Honor Iwo Jima photographer Joe Rosenthal with a US Navy warship. Joe Rosenthal's "Raising the flag on Iwo Jima" is perhaps the most significant photograph of all time. It not only boosted America's morale during WWII, it came to symbolize the US Marine Corps and our nation's resolve to fight tyranny. While the photo is arguably the most recognized and reproduced in the world, the name of the photographer who created it is in danger of being lost to history. A US Navy warship named for the late Joe Rosenthal will keep his name in public in a place of honor, and keep alive the sacrifices of our Armed Forces protecting our Freedoms. Please sign and ask your friends to sign! Thank you! a place in our history. 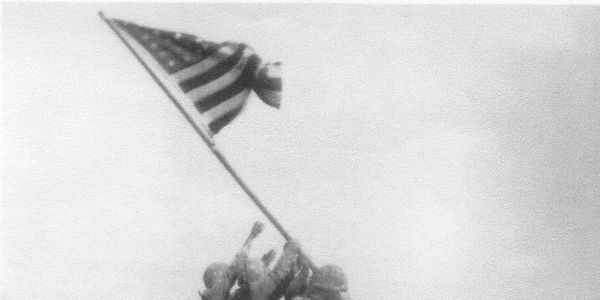 Joe&apos;s Raising the Flag on Iwo Jima is arguably the most reproduced photograph in history. It earned Joe the Pulitzer Prize, ran on practically every front page in America and graced 137 million postage stamps. But neither these accomplishments, nor the photo&apos;s powerful composition, alone define its greatness. "In that moment, Rosenthal&apos;s camera recorded the soul of a nation," one magazine wrote. The sight of indomitable Marines in the Pacific gave Americans&apos; spirits a needed shot in the arm. The country was tired of war and the mounting casualties; and when victory in Europe seemed to be with reach, shocked by the dangerously slim success at the Battle of the Bulge. The photo atop Mt. Suribachi showed we could still fight and win, that our values still prevailed over fascism. The photo became the symbol of the Seventh War Bond Drive, raising $24 billion from ordinary citizens and financing the war effort. Denied enlistment due to his poor eyesight, Joe joined the Merchant Marine as a warrant officer. He photographed in North Africa and on U-boat threatened convoys in the Atlantic. He requested the Associated Press assign him to the war in the Pacific, to "the action." Once there, he sailed aboard numerous US Navy ships and made four amphibious landings, including Iwo Jima. Marines carried their rifles; Joe carried only his camera, exhibiting a different kind of courage. Several times his work alongside the Marines nearly cost him his life. In his later years he was proud to say, "I took the picture, but the Marines took Iwo Jima." Along with the Eagle, Globe and Anchor, the photograph became a symbol of the Marine Corps, earning Joe an award from the Navy, and the title Honorary Marine. The photo still represents the teamwork, courage and tenacity of American service members, and honors them and the nation whose flag they raised over adversity. After 71 years, it is time to honor photographer Joe Rosenthal, and in doing so, honor all who fought at home and on distant shores for peace and freedom. The Joe Rosenthal will keep Joe&apos;s name in the public eye, sharing his story and those of our veterans with new generations of Americans. Photographer Joe Rosenthal was an extraordinary American whose courage, skill and tenacity put him in the right place at the right time. He deserves recognition with a United States Navy warship, the Joe Rosenthal. THANK YOU ALL for pushing USS Joe Rosenthal signatures over 1,000! They will be delivered to Navy Secretary Richard V. Spencer, adding to the 2,054 he received in October 2017. Now, please ask your spouse, kids, grandkids, and friends to sign! Every signature counts toward our goal, and they will enjoy helping Joe and honoring our Vets! Share your message with your email contacts and on Facebook. We've made it easier to sign! Go to www.USSJoe.org and just click on the photo on the homepage. Joe Rosenthal supporters: Help us get to 1,000 signatures so we can send your votes and comments to the Secretary of the Navy. We are less than 50 signatures away! Ask your friends and family to log on and sign so we can reach this milestone. The petition site says 65% of signatures come from signers sharing the site with others. That would be an extra 600 signatures! So tell your friends and please click to Share the petition on Facebook. Two billion Facebook users can't be wrong! Thanks!! Our signature count is lagging, but it is only one aspect of our drive to name a ship for Joe. This morning, the Secretary of the Navy received our petition signatures on paper: 2,054. With our 800+ online signatures, we now have nearly 3,ooo signatures! Online signatures will be sent in Monday, October 9. So there is still time to ask your friends and family to sign! Remember, October 9 is the delivery date, not the end of our quest. Online signatures after the 9th will still count! Thank You!